Offer the satisfyingly sweet taste of sugar without the calories with this sugar substitute stick! This aspartame sweetener is perfect for adding to coffee and other hot beverages, as well as iced teas and refreshing diet soft drinks. Since the composition of aspartame is sweeter than table sugar, allowing your customers to sweeten drinks the way they want. It quickly dissolves in hot or cold drinks, so your patrons will be able to use it whenever they want! Whether they grab this conveniently-sized sugar substitute stick at your cafe counter or grab one on-the-go, this sweetener stick provides an easy-to-use alternative to standard portion packets. Versatile and handy, it's perfect for your hotel breakfast bar, hotel room service, self-service restaurant, diner, party, or event! 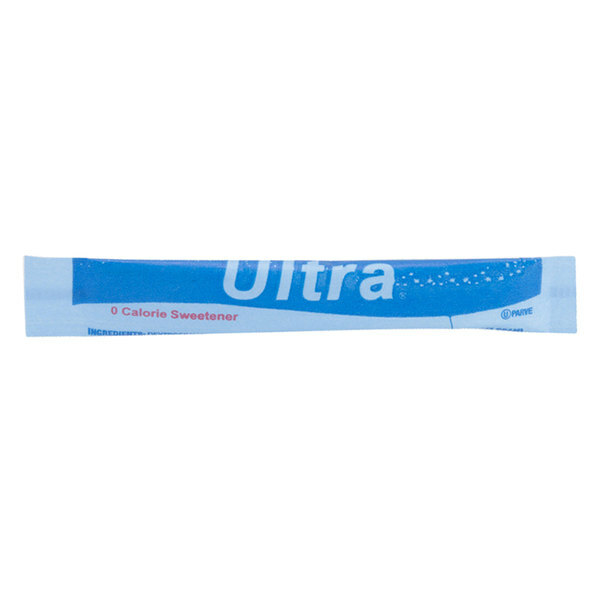 This portion stick of blue sugar substitute makes it easy to reduce the level of sugar, calories, and carbohydrates on your menu. Complement any low-carb recipe with a diet beverage sweetened with this aspartame sweetener. It's also a great sugar alternative for your patrons with diabetes. Offered in slim and space-saving packaging, this sugar substitute stick is great to always have on hand. These little sticks are awesome! They tear really easy and it pours out easier than the packets. The sweetness is really good just as good as name brand. The Ultra blue sugar substitute stick is awesome. We are pleased with the high quality of product and the great taste. The case is well packaged and shipped out fast. We love these sticks for their uniqueness and versatility. They are not that much more expensive than the old fashioned rectangular packets so it become a bit of a novelty. Good price for single serve, Arrived in a few days and couldn't be happier with getting these from Webstaurant. I recommend you order multiple items to decrease shipping costs. You won't find an aspartame sweetener stick at a better price. If your customers prefer stick-type sweeteners for their beverages, this is a perfect solution. Much less expensive than other brand stick packets. Sticks have the advantage of not requiring shaking before use, as well as being convenient for pouring into bottles and thermos bottles. Some lunch counters find their smaller footprint to be an advantage as well. 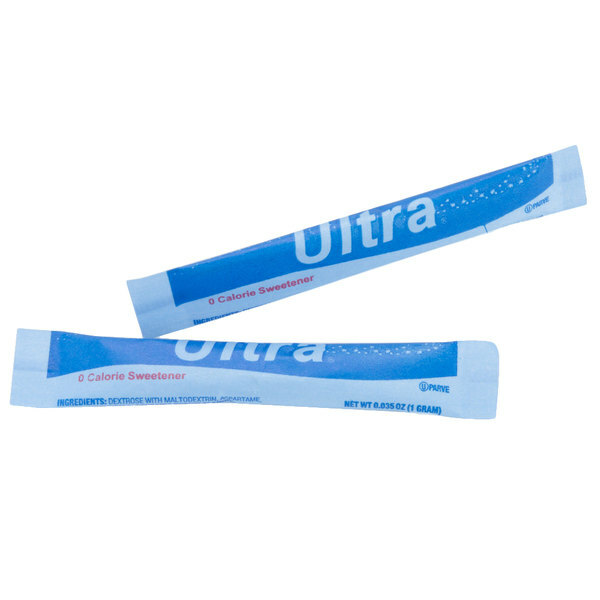 The Ultra Blue Sugar Substitute Stick is such a great alternative to other brands of Equal type sweeteners. You get so many sticks at such a low price without giving up taste. not very expensive and taste good. Fast delivery and very good customer service from webstaurant. Nothing too fancy about the product but definitely do the job! These sticks are great for complementary offering with freshly brewed cups of hot coffee to go!!! Customers find them unique and enjoy talking about them!!! Cute stick format is stylish and easy to put out. We haven't had any complaints about them - they are easy to store in a container with the other stick sweeteners. We recently switched to these sticks instead of the traditional packets to try to set ourselves apart and it worked! We get comments almost daily about how people like them. Highly recommend making the switch!